These days with email and text messages some people are forgetting the personal handwritten note. They aren't even sending birthday cards, just birthday texts. I wish people would get back to being a little more personal. I know lives are busy but the joy of getting a handwritten note or card speaks wonders. 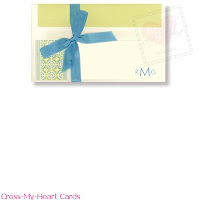 Brides and grooms should especially have special note cards available during the wedding planning. They are going to have to send a lot of notes. 'Thank You' notes to the parents for the engagement party, for shower gifts, for all the wedding professionals for a job well done and of course a note to all the guests for attending the wedding and/or sending a gift. If you are going to send a note before you are married its a good idea to have your name or personal monogram on the card. If you are sending notes to your wedding professionals or guests after the wedding, use your new name, names or monogram. Don't get the standard 'Thank You' written card because its nice to be a little more personal, show off your style and you can use them for all occasions.